This whole purpose of this visit was to oversee the kitchen installation and it was a good job we were there in person. This is what the kitchen looked like earlier in the year after the initial stripping off of the plaster and before the removal of the dividing wall and replastering. 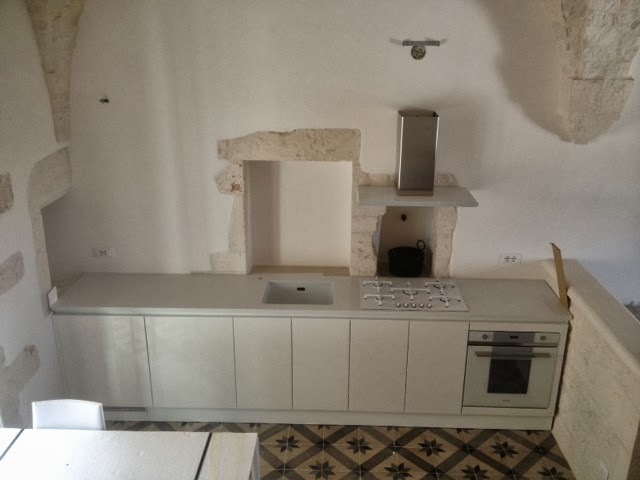 A key feature of the layout was that the sink unit be exactly aligned to the central niche. Most of the sequencing of rest of the units and appliances followed on from that. At one point the workmen said the end spacers meant the whole thing had to move three centimetres sideways. No! Plus it would have blocked one of the electrical sockets. A good job we were there or that is what they would have done. Instead they bashed off the infill end pieces and installed them at the opposite ends where they fitted perfectly. We have a suspicion that the guys at the factory screwed up and pre-assembled the pieces the wrong way round - they fitted the end gaps so well. Once it was in place it was clear that the splash back should not run the full width of the worktop. 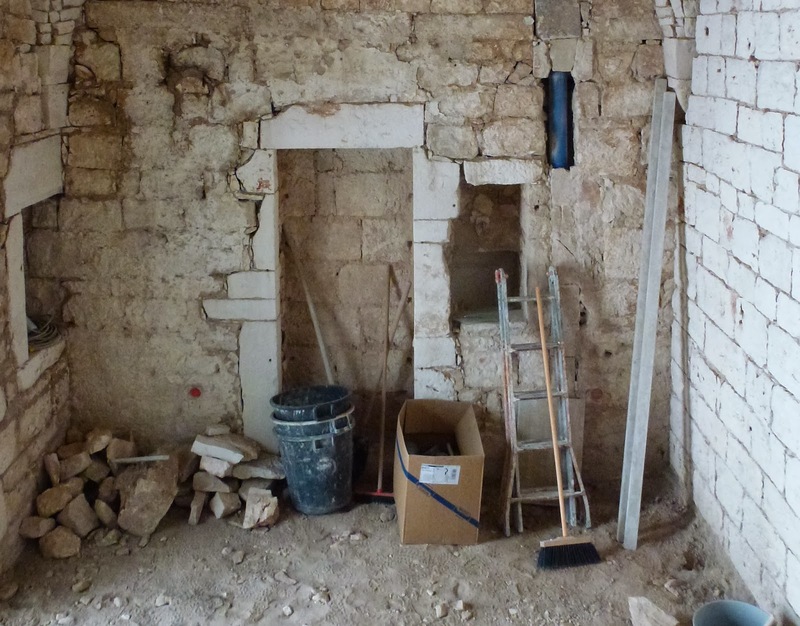 Instead it will be cut to run only where there is plaster and leave the stone and niches exposed. As you can see the colour scheme is white. 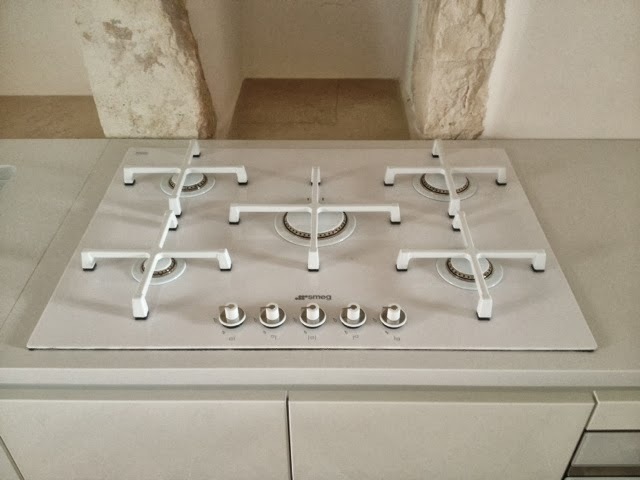 The original hob had grey pan rests but was discontinued and we were able to make the switch to all white SMEG hob and oven. Mary has declared herself extremely pleased with the end result. After we leave the electrician and plumber come in to connect up the appliances. 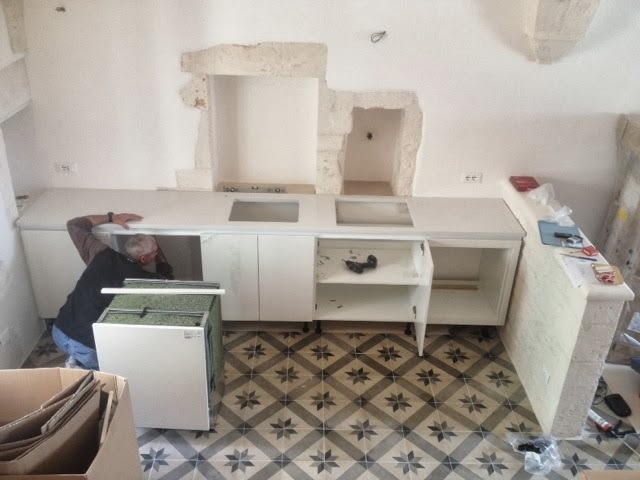 The builder will infill the niches with marble to make them level with the worktop. The mains gas will be connected once Italian bureaucracy has processed the paperwork to approve the installation. All should, hopefully, be working by our next visit in the first week of November.